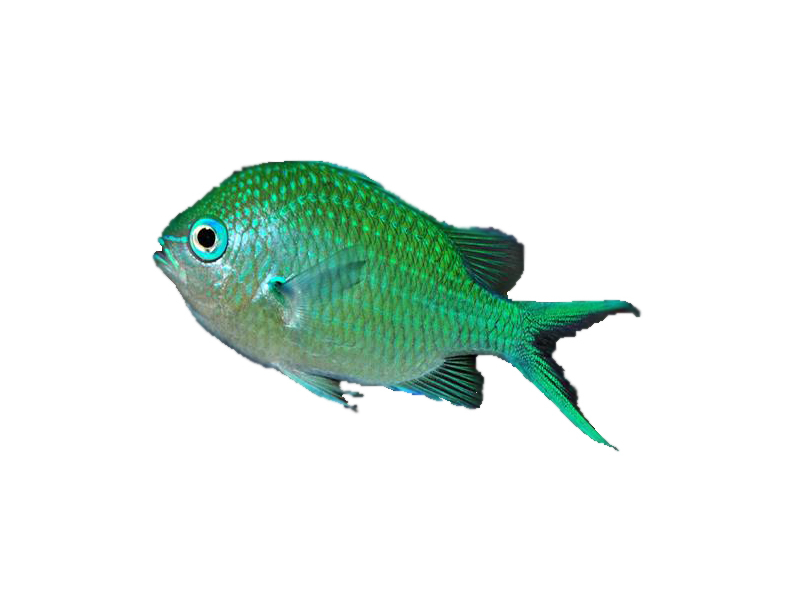 The Reef Chromis is also known as Blue Green Reef Chromis or Green Reef Chromis is very popular fish due to the affordable price, it being easy to care for, beautiful, and peaceful. The Reef Chromis is also a schooling fish, so it adds dramatic wave of color in larger tanks. In the wild the Reef Chromis prefers to swim in schools among branching corals, in the home aquarium a similar environment should be provided. For best care, feed several times throughout the day with a varied diet of meaty foods, herbivore flakes, and frozen preparations. Vitamin-enriched foods may also help to preserve body colorations. Reef Chromis are active swimmers, so no less than a 30 gallon well established tank are suggested for best results. I picked up these fish and could not believe the price compared to other LFS and I have always had good products from the Salty Bottom and will continue to purchase from them and support them. The fish are going strong and doing well.